Quality carports are our trade! At Outside Concepts we specialise in building quality constructions that blend and complement your home. We work with a wide array of styles and designs to achieve a finished product that looks good and performs even better! Here in Queensland Outside Concepts Gold Coast South has recently completed this double carport. Positioned as entry to the property complete with Rollerdoor, it forms an impressive frontage complimented by the stone fence. 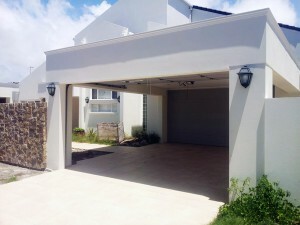 The carport is designed to appear as an extension of the house and indeed as an extension to the garage. In climates like Queensland keeping your vehicle out of direct sun is of paramount importance with many homeowners using the carport as the transit zone between road and garage. The perfect place to load and unload out of the sun. This one has been built using Villaboard – a compressed cement product well-suited to rendering or painting. It’s durable, stable and long lasting and provides the appearance of masonry without the expense of building in concrete or brick. Villaboard has got loads of positive attributes; it’s flameproof, termite resistant and uses cellulose fibres which give strength and lightness. So if you want quality design and construction for your outdoor living project call the professionals for an on-site quote today! Hi, I am looking to add a room and convert the garage and put a carport and wall at the front of my property. Will require a draftsman and bricklayer.